On my first day here, some of my co-workers mentioned Bareburger, that it was amazing, and that they had to go to Brooklyn (Park Slope) on the G train to go there. This is great day to get out, if you don’t need to ride the 7 train today. However, I did…so after 2 really annoying delays on the way to Vernon Blvd., I finally reached Bareburger. This better be worth the journey. A bison burger (I heard it was the best), with vegan cheddar, duck bacon (if you never had duck bacon, please go try it; I insist! ), wild mushrooms, red onions, spinach leaves, tomato, ketchup and mustard on a seeded brioche bun. Along with the burger, I ordered onion rings and had a vegan milkshake made (more on that later). It. Was. Heaven. It was my first bacon cheeseburger in 17 years. Hello, old friend, who got a facelift and became organic while I was gone. How are you? Oh, burger, I wish you were a bed, so I can lie in you all day. 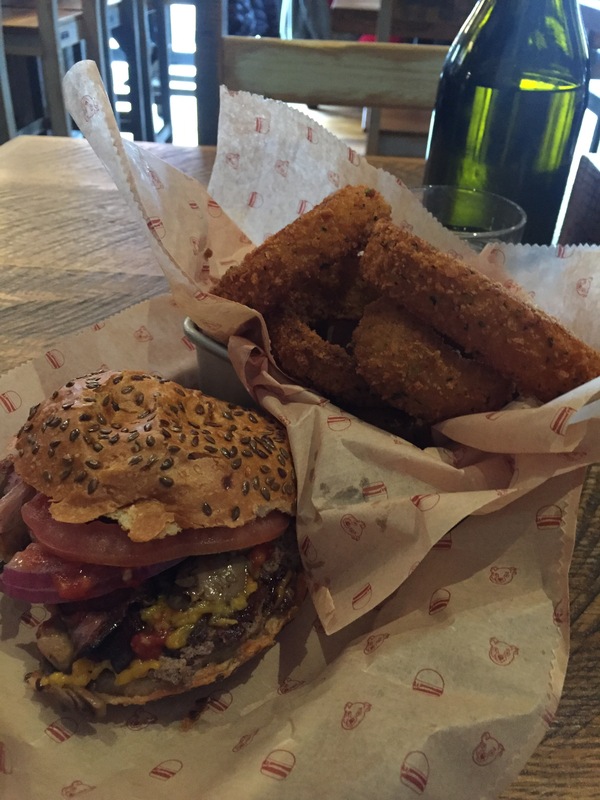 The onion rings were crispy, fresh, HUGE, tasty and seasoned just right. And, the vegan shake. It’s called the Coconado: Coconut milk and ice cream, avocado, lime juice and shaved coconut. So insanely good! My server Alfonzo, was such a delight. His knowledge of the food items were both encyclopedic and obsessional. He made me feel right at home. This is definitely not a cheap lunch. I’ll save this place for once-a-year, special occasions, because if I went there every day, I would end up weighing a thousand pounds. It’s that good.